It looks like another weekend with quite severe weather for Islay, the latest weather graphs for Port Ellen indicate strong winds with gusts of well over 60mph. Severe weather warnings have been issued for Strathclyde by the Met Office for today and Saturday. 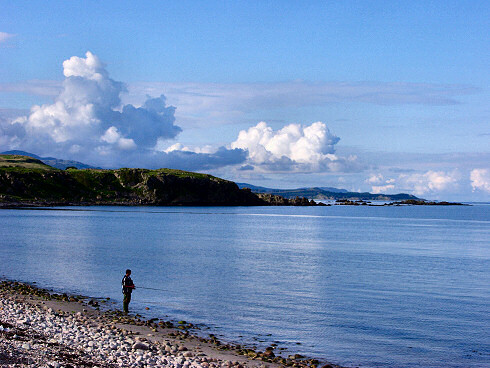 Quite different to the calm summer evening (despite the dramatic clouds) at Claggain Bay in Summer 2002, the picture is from this day on Islay during my World Tour of Scotland 2002. A perfect end to the day, looking over this beautiful bay on Islay. With that thought I'm going to sign off for today, I hope you will have a great weekend (without any server hiccups to get annoyed about) whereever you are and whatever your plans are!